We all have learned about the eight parts of speech in our school days. If you recall, these parts of speech form the building blocks of English grammar. But, how is it important for CAT? 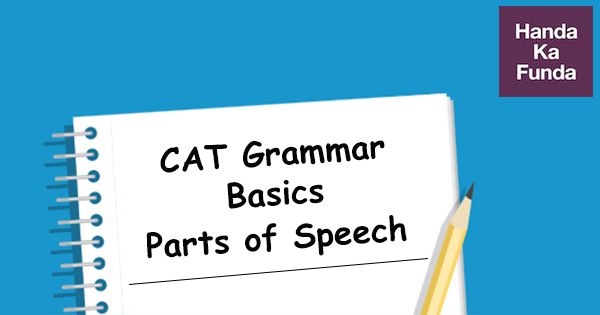 Well, learning about the various parts of speech and the related rules will help you answer the grammar-based questions accurately. Such questions may feature in form of error detection, sentence correction, fill in the blanks and word usage. In other words, the grammar section holds a crucial weight in CAT verbal ability. So, what must be the most important part of speech? Something without which a sentence cannot exist? Yes, it is the ‘doing word’- VERB. In other words, verbs express an action or the state of being. She is going to England. Further, there are three basic types of verb- transitive, intransitive and helping verbs. In the above example 1, ‘missed’ is a transitive word while in example 2, ‘sleep’ is an intransitive verb. But what is the verb in example 3? Well, ‘is’ is a helping verb while ‘going’ is the main (action) verb. Another special thing about verbs is that they can take an implied subject without actually stating it. Putting in other ways, verbs form an essential part of our life. Proper Nouns: These refer to the specific names of persons, things, places, etc. E.g. Jennifer Lawrence, Italy, Pepsi, etc. Common Nouns: These denote the generic names of places, things, people, etc. E.g. TV series, car, student, etc. Abstract Nouns: As the name suggests, these refer to the names of abstract things like feelings, qualities or state. E.g. happiness, wisdom, childhood, etc. Collective Nouns: A group of things, animals or people is represented by collective nouns. E.g. crowd, flock, herd, etc. Countable Nouns: As the name states, countable nouns are the names of things or creatures that can be counted. E.g. book, kitten, brother, etc. Uncountable Nouns: In contrast to the countable nouns, uncountable nouns refer to the names of things we cannot count. E.g. oil, milk, sugar, etc. As you would know, nouns indicate the subject and object of the sentence. In other words, they enhance the specificity in the sentence. So, what could be the third most important part of speech? We often need to know the connection or relation between things or persons. Here comes the role of PREPOSITIONS. Prepositions are generally placed before a noun or pronoun to show the relation of a person or thing with respect to something else. Simple Prepositions: These are small words used in simple sentences. E.g. Diana is not going with Steve. Other such simple prepositions are: At, by, for, in, from, into, of, off, on, out, over, through, till, to, up, upon, under, down, etc. Compound Prepositions: These words are used before noun, adverb, and adjective. As the name states, they connect two nouns, pronouns or phrases. E.g. I will reach there before he leaves. Other compound prepositions are: about, amidst, across, within, among, beside, amongst, beyond, above, along, inside, between, around, behind , beneath, etc. Phrase Prepositions/Prepositional Phrase: As the name says it, a group of words form a phrase preposition. In other words, a phrase functions as a preposition. E.g. He succeeded by means of perseverance. Other phrase prepositions are: according to, on behalf of, on account of, with regard to, in spite of, because of, away from, etc. Participle Preposition: As you would guess, here verb + ‘ing/ed/en’ form of words function as prepositions. E.g. My project work is still pending. Other such prepositions are: respected, barring, considering, during, following, including, given, concerning, provided etc. So, as you would have observed by now, prepositions express the relations like a place, time, manner, cause, contrast, motive, etc. The above examples illustrate various types of adverbs. Now, just like adjectives, some adverbs also have degrees of comparison. E.g. fast, faster, fastest. Mark and Chris are good actors. As you can see, different kinds of conjunctions are used in the above examples. But how do they differ? Well, if you see the example 1, 2, and 3, the conjunctions are joining two statements of equal rank. These are called coordinating conjunctions. A special type of this is used in example 2; such pair of words (either.. or, so.. as, etc.) are known as correlative conjunctions. On the other hand, examples 4 and 5 illustrate subordinating conjunctions. If you observe carefully, sentences 4 and 5 contain a dependent and an independent clause. Further, the purpose of subordinating conjunctions is to convey time, cause, purpose, condition, comparison, etc. The above examples illustrate different kinds of pronouns. Indeed, pronouns play a great role in our lives and remove the redundancy of using nouns repetitively. Coming to the last part of speech, let’s talk about the words that express sudden feelings and emotions. These are called INTERJECTIONS. As you would notice, interjections are not grammatically related to other words in the sentence. E.g. Oh! I got such a fright. Other such words are hurrah, alas, hush, bravo, etc. They are also used as a group of words like Well done, Good gracious, etc. In other words, you can recognize them quite easily by the intensity of emotion they convey. Now, you are aware of all the parts of speech. Do practice grammar questions as frequently as possible. Grammar is the second most important section of Verbal ability after RC section. Indeed, it is scoring and easier as well. All you need to do is go through some fundamentals and familiarize yourself with some rules. You can also see Why Online Education is becoming a preferred choice these days?